The October update for Windows 10 is currently being rolled out to the general public. For those in the Fast ring of the Insider Preview program, however, the build of the future is available to try out. This update, known as 19H1, includes an improved Light Theme and some other things Microsoft had promised. The Windows 10 build 19H1 will be the next major update to the OS after the October 2018 update being rolled out right now. It is available, but only to those enrolled in the Fast Ring of the Windows Insider Preview at present. 19H1, also known as Build 18282, will have a number of new cosmetic and UI optimizations. 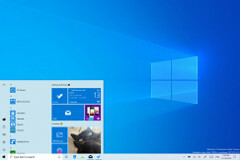 For example, it includes the long-awaited true Light Theme, in which components of the interface such as the taskbar, Start menu and Settings are a bright shade of blue rather than remaining black or white. It is also matched by a new light default wallpaper only available in 19H1. The OneDrive fly-out, on the other hand, now complies properly with Dark Theme in the preview. 19H1 also comes with more specific and clear print destination icons. It also has window snip, which is the option to crop screenshots after taking them. Pause Update is also now to be found in the first layer of the Update page in Settings rather than buried under links, and changes in brightness caused by a switch to battery power will be more clearly indicated. Microsoft has pledged to bring many of these changes as a result of feedback from users. However, 19H1 may still be buggy in this form as it goes through the Insider Preview.